Soak raw rice, urad dal, fenugreek seeds, bengal gram, tur dal in enough water for 4-5 hours.Wash and grind everything together to a smooth texture adding water, little at a time. Add needed salt and leave it overnight to ferment. 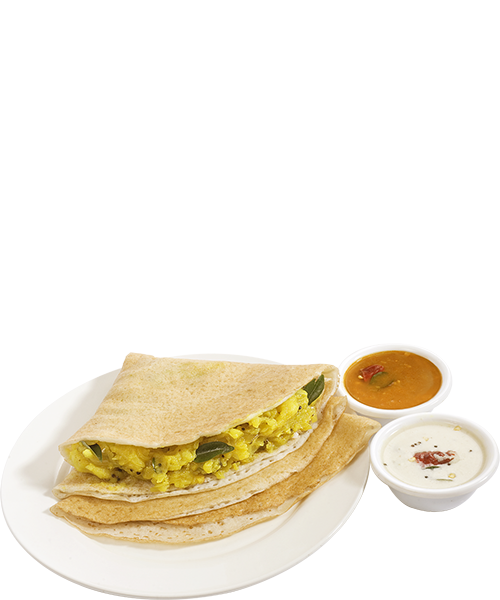 Before making dosa, add a tsp of sugar, little water and mix well to get the dosa batter consistency. The batter is ready to make masala dosa. Wash and cut potatoes into half and pressure cook for 3 whistles. After it cools, peel the skin and mash it well. ( not to a fine paste) Keep it aside. Cut onions lengthwise, finely chop green chillies and ginger. For the seasoning Curry leaves Oil Mustard ,Urad dal, Asafoetida. Heat oil, add mustard seeds,Urad dal When dal turns golden brown, add thinly sliced onions, green chilli, ginger and curry leaves and Add turmeric powder, and salt needed. Add 1/2- 3/4 cup of hot water, when water starts boiling, add the mashed potatoes. Mix well and cook for few minutes (around 5-6 mins) until everything gets blended well. Once the tawa is heated, bring the flame to medium and pour a ladle of batter in the center. Using the back of the ladle, spread the batter in a circular motion Once the edges starts browning and the dosa is cooked, reduce the heat, add 2-3 tbsp. of potato masala, a little butter (optional ) and fold the dosa.